Businesses across all industries are struggling to identify and deliver competitive advantage and innovative differentiators. This is certainly true within financial services: Established players are under increasing pressure from regulators and challenger banks alike to improve their products and services. As modern technologies evolve with increasing speed to meet tomorrow’s needs, it isn’t necessarily clear how to reveal or optimize their potential within your business. How can your business innovate to include the latest technologies, such as AI, ML, IoT, and more? 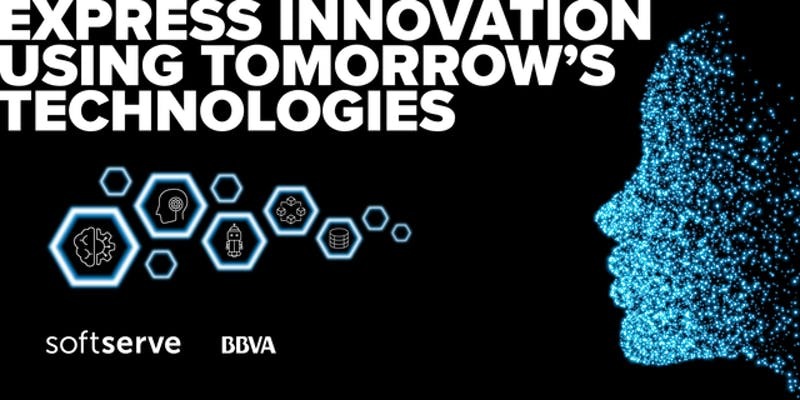 Join us at Level39 for SoftServe + BBVA: Express Innovation Using Tomorrow’s Technologies. Come hear innovation success stories from BBVA, a leading global bank at the forefront of industry innovation. We’ll even provide food and drink! Together, we will demonstrate some recent projects leveraging AI, ML, IoT, and blockchain, and give an overview of how easy it is to use advanced technologies as part of your innovation. Reveal what AI, ML, robotics, blockchain, and big data can do for your business, or accelerate what you’ve already started. SoftServe digital technology experts and our simple idea management methodology will help you get there faster. Register now to secure your spot! Each attendee must be registered using their own name and contact info to attend this event.